ArcGIS Pro provides the capability to add a multidimensional raster layer directly to the map view. When adding this type of layer, the users can choose to import one or multiple variables at the same time from a multidimensional dataset. Those variables are multidimensional arrays that represent data in given time or vertical dimensions, for example the global ocean temperatures with both time and depth dimensions. Scientific datasets in netCDF, GRIB and HDF formats are commonly saved in multiple dimensions. When a multidimensional raster data layer is added to the map view from the Add Multidimensional Raster Layers dialog box, the system applies the default Multidimensional Raster processing template, and creates one multidimensional raster layer per each selected variable. The new raster layer contains the multidimensional information from the variable, which can be visualized, analyzed and shared. From the Add Multidimensional Raster Layers dialog box, you also have the option to select the Multiband Raster or Classic NetCDF Raster processing templates. Using the Multiband Raster processing template enables all the selected variables to be composed into one multiband raster layer, with each band representing one variable. The variables are usually homogeneous, and can be composited into a multiband image for display and comparison. For example, the MODIS sensor reflectance variables from different bands can be combined into one multiband raster layer. Using the Classic NetCDF Raster processing template, a classic netCDF raster layer is generated similar to the output created by the Make NetCDF Raster Layer geoprocessing tool. 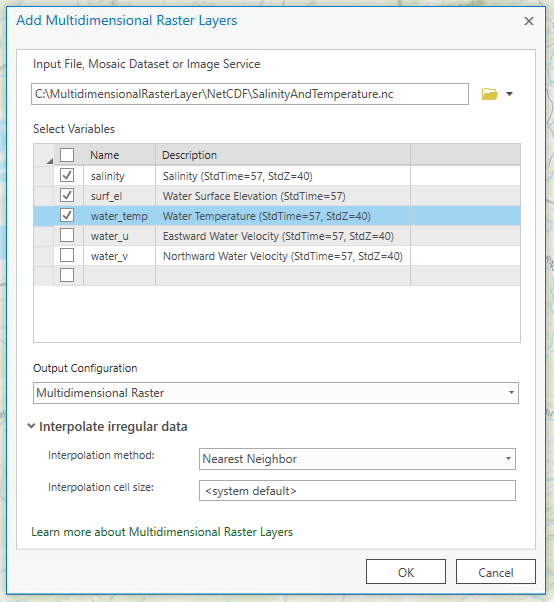 If your data is an irregular in spatial resolution, use the Interpolate Irregular Data setting on the Add Multidimensional Raster Layers dialog box to interpolate your data into a regular grid. When you need to manage large amount of the multidimensional datasets, it is recommended to add the variables as raster imagery into a mosaic dataset. See Multidimensional dataset in a mosaic dataset for details. The steps to add a multidimensional raster layer to the map view are outlined below. It is assumed that you have scientific datasets in either netCDF, GRIB or HDF format to use in these steps. On the Map tab, in Layer group, click on the Add Data drop-down menu and select Multidimensional Raster Layer. This opens the Add Multidimensional Raster Layer dialog box. On the dialog box, click the Import variables from sample file button to open the Import variables from dialog box. Browse to a GRIB, netCDF, or HDF format. Click Open to import variables from the selected file. On the Add Multidimensional Raster Layer dialog box, in the Select Variables table, select one or multiple variables. For the Output Configuration parameter, use the Multidimensional Raster default , click OK to add a multidimensional raster layer or multiple layers to the map. Optionally if you want to generate layers using the Multiband Raster or Classic NetCDF Raster processing templates, repeat steps 1 through 3 to go to the Output Configuration and make the selections. Click OK to add the layer or multiple layers to the map. Visualizing the multidimensional raster layer is similar to displaying the Multidimensional Mosaic Dataset. Set the Time Extent, then use the time slider to animate the layer. If your layer also has other vertical dimensions such as depth, specify the field name for the range slider, then use the range slider to animate vertical dimensions. See Visualize temporal data using the time slider and Get started with range slider for more details. In addition, you can also run the Select by dimension geoprocessing tool to update the display based on the dimension values. Multidimensional raster layers can be processed and analyzed on-the-fly using raster functions. For example, you can use the Zonal Statistics function to calculate statistics for the multidimensional raster layer, based on values within the zones of another dataset. See the complete List of Raster Functions for summary of each raster function. In addition, you can chain the raster functions together and create custom raster function templates to calculate complicated scientific equations. ArcGIS Pro provides the capabilities for distributed processing of imagery and scientific data using Raster Analysis on Portal. You need to configure your portal to perform raster analysis. You can publish your multidimensional raster layers from ArcGIS Pro. Before publishing, verify that the time and range properties are enabled on the layer. An associated map service is published on the portal's federated server that was specified when publishing. The map service contains the multidimensional information that you can visualize using the time and range slider in the web browser. You can also enable a WMS in configuration on Share as Web Layer pane to consume the WMS capabilities on the published layer.